October 1, 2005 - Peterborough, Ontario. It was the Kevin Fletcher (#1 It's a Wrap) and Rob Degeer (#37 HB Cycle)show as Fletcher took the his first feature win and two heat wins, Degeer won two heats as well, in the Tribospec/Sunoco Lubricants Ontario Legends twenty-five lap feature race. Dave Foss (#44 Balmar Petroleum) and Fletcher jumped out to an early advantage, with Fletcher jumping into the lead after diving to the low side of Foss as they raced into turn three on the opening lap. Both Jimmy Cuthbertson (#64 D S Martin Mechanical) and Degeer both quickly closed in on Foss as Fletcher opened up a sizable lead, while Gord Foss (#94 Sunoco), Chris Maracle (#23 Barry's Hot Rod) and Paul DeJong (#43 Scott Reed's Car) fought over eighth position. Bruce Grimes (#88 Tascor Construction) then joined the battle for second as he caught Cuthbertson and Degeer. Just past the halfway point, Degeer got under Cuthbertson and took over the runner-up spot. He then set out and caught Fletcher with eight laps remaining. The pair battled the remaining eight laps, but Degeer was unable to get past Fletcher. At the finish line, it was Fletcher, Degeer, Cuthbertson, Grimes and Gord Foss. Tribospec/Sunoco Lubricants Ontario Legends heat race winners were Rob Degeer and Kevin Fletcher, each with a pair. Andy Warbutton (#24 Shoeless Joe's) claimed the overall Ontario Legends Series point’s title, for the third year in a row, followed by Steve Navritil (#55 Super Tint) and Bruce Grimes. Chad Windsor of Ottawa (#5 Wright Excavating) is rookie of the year. 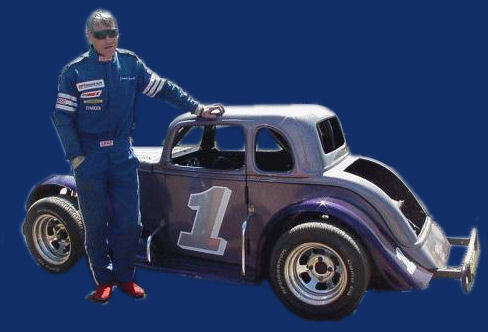 A few of the regulars were missing, Frank Johnston, Steve Navratil and Andy Warbutton went to Lake Erie Speedway to represent the Ontario Legends at the INEX Legend Car Nationals.